Fever isn’t the real problem. It’s a symptom of something else. You must treat whatever that is to relieve the fever. Economic indicators are similar. 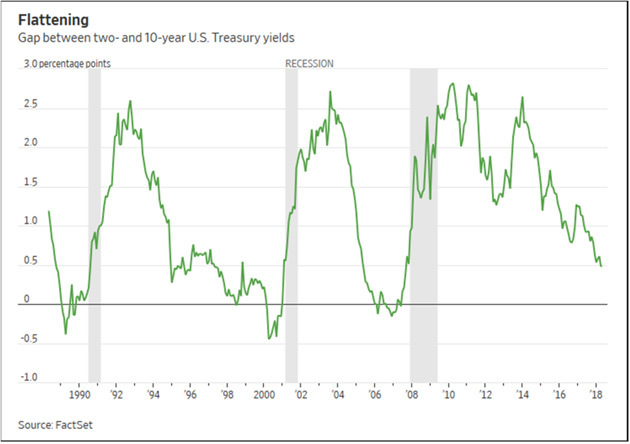 Lately I see a lot of talk about the flattening yield curve and speculation it might invert as the economy enters recession. If that happens, the inverted yield curve won’t be the culprit. It will point to another culprit, or combination of them. This is something I watch carefully because a recession is long overdue, if history means anything. Some argue this time is different. Maybe so, but I’m not inclined to bet on it. Today we’ll explore some reasons why. First, a little business nostalgia. If you read Outside the Box this week, you saw that Wednesday’s issue was the last one ever. I must say, I felt more than a twinge of sadness when hitting the “send” button. It’s not easy to end anything after fourteen years. Still, it was a necessary change. As you know, there’s a lot more going on in my life than there was five or ten years ago, and I need to do an ever-increasing amount of research to stay on top of my game. Plus, I need to start penciling in some downtime, too! John—Don’t leave us hanging by our fingernails, let us know what you’re planning. I’ve been very impressed by your network and the information that you pack into these two newsletters. I hope we will be able to continue to have access to you and yours. Well, Tom, I can tell you (and everyone else reading this letter) that Monday, April 30, will bring the Great Unveiling. My editor Patrick Watson and I think of it as The Big Reveal. Think the final moment in a magic act. Maybe I don’t qualify as an economic magician, but I have had a few surprising “reveals” in this letter. And more to the point, not only will you still have access to me and my friends and associates, we’re giving you more valuable access, in a way that fits neatly into your schedule. I better stop before I say too much, but please watch your inbox for an email from me on Monday. Now, on with our fever treatment, which of course, brings up a story. In late 2006, when the yield curve was last in the process of inverting, I put in a call to then New York Fed’s Dr. Fred Mishkin, who co-authored a seminal report reviewing 20 different indicators as recession forecasting tools. They found only the inverted yield curve had any true significance, and then it was generally a year early. I had first used that signal back in 2000 to forecast a recession, using their research but just as important, what I learned from one of my earliest economic mentors, Dr. Gary North. Back in the early 1980s, Gary pounded into me the inverted yield curve’s importance in forecasting recessions. Later, Professor Campbell Harvey of Duke came along with his groundbreaking work, and then Mishkin and his New York Fed colleagues—which if I remember right was in 1996. Anyway, Mishkin returned my call, and I asked his thoughts on the then-current inverted yield curve. Did this mean a recession? He was actually quite reserved and told me an unqualified “maybe, but not necessarily. This time could be different.” I pressed, but he stuck with that answer. There weren’t that many of us in late 2006 ready to make the recession call. Last week brought a little (at least short-term) good news if you’re worried about the yield curve inverting, i.e. 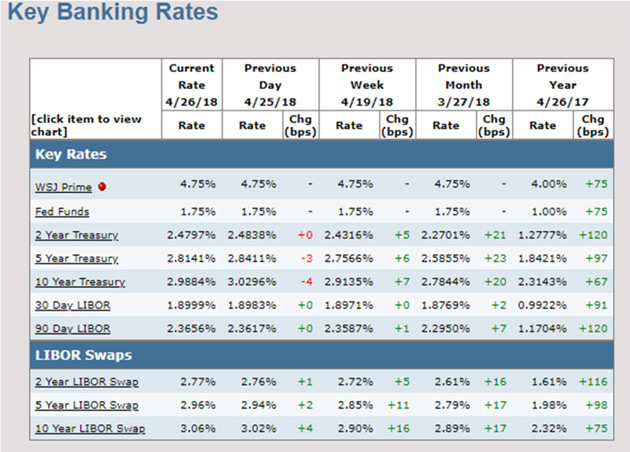 short-term rates rising above long-term rates. The ten-year US Treasury yield rose above 3% for the first time in four years. This will be the opposite of inversion, if it persists. It makes the curve steeper unless short-term rates rise even more. Nonetheless, the yield curve is still abnormally flat. The gap between two-year and ten-year Treasury yields hasn’t been this low since before the last recession. Note in the graph how this gap dropped below zero—i.e. inverted—shortly before the last three recessions. We haven’t seen it yet in this cycle. But we certainly could see inversion within the next year or so if it keeps dropping at the current rate. That’s quite possible if the Fed keeps hiking because they have hit their inflation and employment targets. The Fed is now walking a very tight rope. They know, deep down and viscerally, that they have to get rates back up so that they will have a few “bullets” for the next recession. It is likely they will keep hiking rates until we get to an inverted yield curve. Are they aware of all the literature and what they’re doing? Absolutely. Candidly, I can’t imagine accepting a Fed appointment knowing that we are this late in the cycle. Does an inverted yield curve guarantee a recession? No, but inversions are strong evidence one is forming. Last month, yet another new San Francisco Fed study found an inverted yield curve, which predicted all nine US recessions since 1955, is still valid even in today’s low-rate environment. However, yield curve inversion is a far-leading indicator, which is why my previous recession and bear market calls were early. Those nine recessions all began 6–24 months after the yield curve inverted. And, in the ones I’m old enough to remember, many experts spent those months telling us that this time was different. (Spoiler: It wasn’t.) And I expect the same again. Look around at all the great economic news. I’m aware of it. But the economy was hitting on all cylinders in early 2000 and late 2006, too. The numbers always look great right before a recession. Then it all rolls over at once. Like that fever I mentioned, an inverted yield curve doesn’t immediately damage the economy. It points to damage that’s already happening—an underlying infection. It means bond investors have lost short-term confidence in the economy and want to lock in longer-term interest rates. You don’t want to buy, say, one-year bills if you think rates will be lower when it’s time to reinvest them. That will be the case if, for instance, you expect the Fed to be lowering rates to stave off recession. One point about that economic fever. I said that fevers don’t kill you, they are a symptom of something being wrong. Well, that’s not actually true. If a fever gets high enough or lasts long enough, it will kill you. Which is why hospitals work so hard to keep your fever down. A steeply inverted yield curve that goes on long enough is like having 108° fever. Both banks and shadow lenders go upside down on their “book” and stop making loans. That can freeze the economy and makes a garden-variety recession even worse. Which is why any central bank facing that scenario lowers rates and fights the yield curve. The London Interbank Offering Rate (LIBOR) has for most of my adult life been the world’s most important private interest rate. By now you know that it is going away, and new substitutes are coming. But LIBOR is still out there for a short time, so let’s look at it. But in any case, there’s now less than a 60-basis point spread on the Treasury 2/10 and half that if you’re using LIBOR, which I think of as more free market. If you go out the LIBOR swap market, you find a 20-year swap is not much different than a 10-year. The further out the curve you go, the flatter it gets. This is what happens at the end of an economic cycle and right before the yield curve inverts. 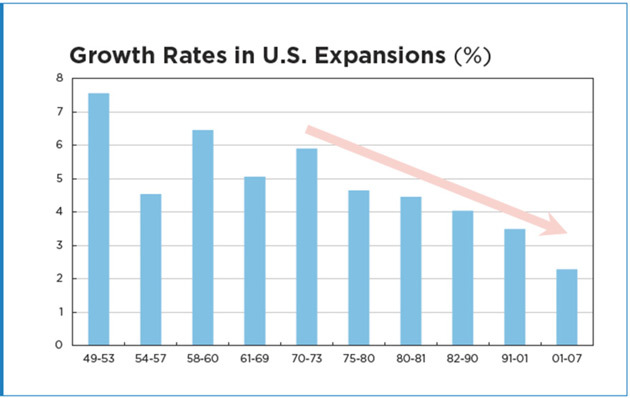 In that article, Lacy described how M2 growth decelerated ahead of 17 of the 21 recessions since the early 1900s. He then dug into the four exceptions (marked A, B, C, and D on the chart) to see if they disproved the rule and found they did not. What is M2? It is a broad measure of the money supply, including cash, checking, and savings accounts, time deposits, and money market mutual funds. In a healthy economy, M2 should be growing. Diminution of that growth suggests recession is coming—but like the inverted yield curve, not necessarily soon. As he told me, broad measures of monetary growth can begin to decline two years or more before you have an actual recession. Again, this symptom results from an underlying disorder. 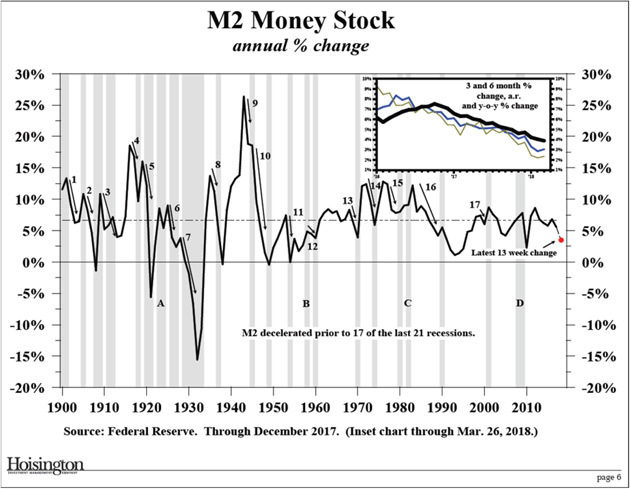 M2 money supply grows with bank credit growth. It falls when banks reduce lending growth. They do that when finding credit-worthy borrowers gets harder, as it does in a recession. So here again, we see a condition that isn’t itself problematic but points to one. Lacy explained in his quarterly why this is a concern now. In the first quarter of 2018, M2 growth decelerated to just above a 2% annual rate. Year-over-year, M2 growth slowed to just 3.9% versus the 6.6% long-term average growth. Additionally, bank credit growth declined 0.6% at an annual rate. Loans continued to inch upward but only because the banks’ securities portfolios fell. Loan volume does not typically fall until an economy is in a recession because firms borrow to finance an unintended rise in inventories. Note that credit growth doesn’t have to go negative. It rarely does, the main historical exception being the Great Depression. The key is its direction and distance below that 6.6% long-term average. The present 3.9% rate is the lowest since 2009. This again points to recession on the horizon. Not next month or even this year, but likely within 2–3 years. When credit growth is weak, the United States falls into recession. Between 1952 and 2008, there were only nine years when total credit (adjusted for inflation) grew by less than 2%. Each time, there was a recession. In 2017, total credit grew by just 1.9%. This was the first time credit growth has fallen below the 2% recession threshold since 2013. Total credit in the United States reached $68.5 trillion at the end of 2017. Given such an enormous base, it is difficult for credit to expand by 2% after adjusting for inflation. For instance, if the inflation rate is 2%, then total credit must grow by 4%, or by $2.7 trillion, just to reach the 2% recession threshold. If inflation increases to 3%, then total credit must grow by 5%, or by $3.4 trillion, to get there. Credit growth on that scale is not easy to achieve, especially given stagnant wages, the already high level of private-sector debt and, now, increasing interest rates. The latest Macro Watch video forecasts US credit growth out for the next three years by considering the outlook for borrowing by each of the major sectors of the US economy. With inflation trending higher, it looks as though credit will expand by only 1.7% a year during 2018, 2019, and 2020. If those forecasts prove to be correct, the chances are high that the United States will soon fall back into recession. According to central banks and some on Wall Street, the US and global economies are right on the cusp of breaking from the post-recession doldrums. They think their aggressive monetary policies are finally bearing fruit, helped by tax cuts and other factors. Hence, the Fed is now tightening policy lest this inevitable growth spark too much inflation. My friend Lakshman Achuthan of the Economic Cycles Research Institute is not convinced. He recently sent some slides I want to share with you. (He will be at the dinner on Tuesday, and he was gracious enough to talk me through these this week.) This first one shows that the present, low-grade expansion phase is the latest in a series. By the way, the ECRI is as close as we have to “official” economic cycle watch service in the country. Note, this is growth during times when the economy is not in recession, which should be considerably higher than the full-cycle averages. It has been falling steadily since the 1970s and is now below 2%. If the best we can do is 2% not counting recessions, it’s hardly time to proclaim victory. 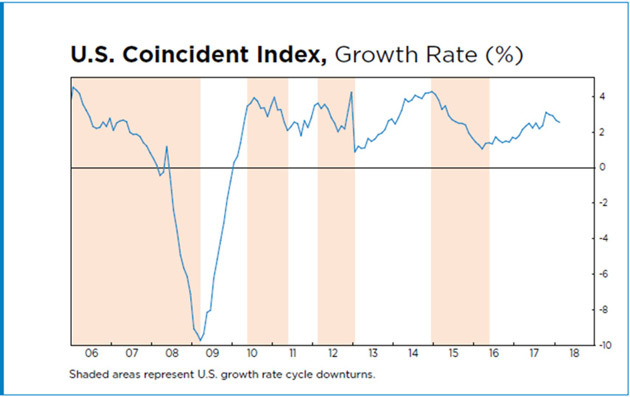 The next chart looks at the ECRI U.S. Coincident Index, which is their alternative growth measure. The shaded areas are cyclical downturns, the three most recent of which did not reach recession status. The important point here is we see little or no improvement in the growth rate. Since 2010, it has moved sideways in a tight range. In the last two years, it moved up to about the middle of the range, which is positive but doesn’t mean the US economy is off to the races. 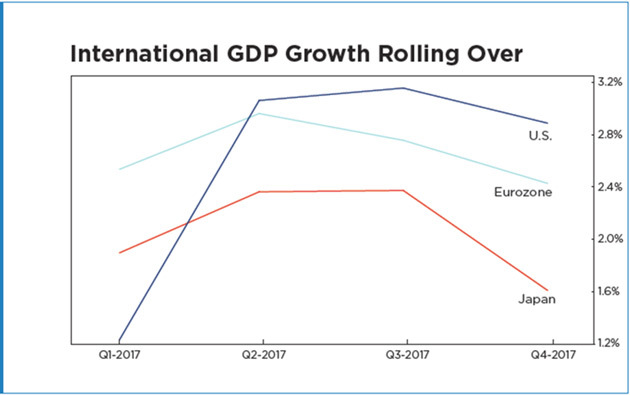 Finally, and most ominously, Lakshman shows this chart of quarterly GDP growth in the three largest developed market economies. We see in all three places that quarterly growth peaked in mid-2017 and then fell in the last quarter. Yet the experts tell us a synchronized global recovery is forming. Really? What I see here is a synchronized downturn. Granted, it’s just a couple of quarters but early data makes Q1 2018 look lower still. If a recession is coming, GDP growth will decline from its present level to 0% or below. That process will likely unfold over a few quarters—and may already be beginning. On top of all this, we have a fast-growing federal debt. I realize some readers are of the “debt doesn’t matter” persuasion. With all due respect, the debt does matter for reasons I will explain below. Yes, we owe this money to ourselves and maybe it will all balance out eventually. But we must get there first, and the road is not necessarily smooth. Let’s look at some data from my friend Luke Gromen, who runs a unique advisory service called Forest for the Trees. His informative letters are typically short, and I’m becoming quite fond of them. The most recent one had some fascinating points on the debt. 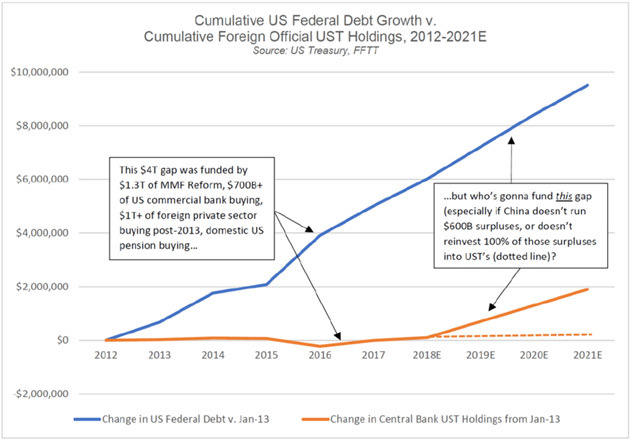 First, Luke says one of the least-noticed recent developments is that foreign central banks stopped net purchases of US government debt about five years ago. This is important because someone has to fund our deficit spending, and the job is not getting easier. It’s getting harder, in fact, as Luke’s next chart shows. By the way, this gap is conservative. 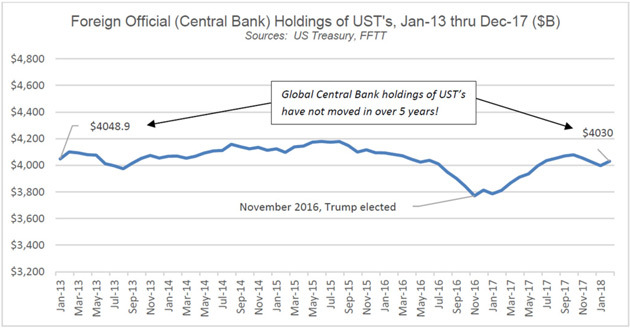 It assumes the US will have no recession by 2021 and that foreign central banks will hold their Treasury portfolios to maturity. The recent trend line suggests they won’t. It also assumes China will keep running a $600B yearly current account surplus with the US and buy US Treasury securities with all of it. Those aren’t guaranteed either—and will certainly change if the Trump administration succeeds in reducing the US-China trade déficit. To this point, the Fed and Treasury have filled the gap with assorted contrivances, such as forcing banks and money market funds to buy more Treasury bonds. These have run their course and no replacement tools are obvious. That leaves one option: higher interest rates. People will loan their money to the government if it gives them enough incentive, and higher yields will do it. How much higher? We don’t know, but it won’t take much to further reduce bank lending activity, which will reduce M2 and push the economy closer to recession. Investors will further extend their maturities, inverting the yield curve. That, my friends, is a fever that won’t feel good at all. By now, everybody knows we are in the slowest recovery on record. Lacy Hunt blames ever-increasing debt, which is a drag on growth. He has tons of academic literature to support his position, and I agree with him. That the next recovery will be even slower. Go back to what Richard Duncan said earlier. When credit growth drops below 2%, a recession almost always follows. Lacy tells us that bank credit growth is down to 0.6% since the beginning of the year. That is ugly. I now have to officially put my recession watch antenna firmly in place. The models that my four ETF trading strategists follow (using their significantly different quant models) are all beginning to de-risk their portfolios. Given the volatility of the market, that has been a good decision. Have they pulled all their chips off the table? No, not even close. But they are closer than they were one year ago. In short, there is not enough data to have me predict a recession and the consequent bear market. But there’s enough data bubbling up all around me that it makes me very nervous, and I am paying close attention. You should be, too. First, please join David Rosenberg and many of my friends in giving to the Richard A. Yamarone Memorial Scholarship in Economics at Brooklyn College. For those of us who knew Rich personally, we have all been devastated by his sudden passing away from a massive heart attack while he was playing his beloved game of hockey. Not watching, mind you, but playing. That was the way Rich was, even at 55. I will miss one of my best friends and the economic Darth Vader in my life. He was the chief economist for Bloomberg and deeply loved by everyone he knew, simply because he was the nicest guy in any room he entered. We need to produce more like him, so please follow the link above if you are so inclined. To those of you who have answered my call, a huge debt of gratitude. I am writing this from Florida. After my speech here, I fly back to Dallas where I will shower, change bags, kiss Shane, and then fly to Iceland overnight. Next week, I have several meetings in New York and the dinner I mentioned above with Art Cashin and friends. I’m also seeing Ian Bremmer, where we will talk about his latest book that was in my last Outside the Box. I should have it read by the time we get together. It is time to hit the send button. I make a speech in 19 minutes somewhere in this hotel, so I better get on my pony and ride. You have a great weekend! Can Baby Boomers Succeed in a Millennial World? You’re in a staff meeting with the new boss. As you sit there thinking she must be about the same age as your daughter, she welcomes two new apple-cheeked team members whom, you have heard, the company hired at half of your salary and the salary of the workers they are replacing. You are asked to mentor one of them on a “new” initiative — an idea, it turns out, that is a lot like a project you led a decade ago. You feign enthusiasm. The plight of the baby boomer in an increasingly millennial-focused workplace is playing out with greater regularity. Next year, 20-to-35-year-olds are poised to overtake 52-to-70-year-olds as a percentage of the U.S. population, according to the Pew Research Center. Many baby boomers today find themselves reporting to supervisors younger than themselves. Working at a time of great pressure for higher corporate profits and increasingly sophisticated technical skills, boomers, after spending years as the most coveted generation, often now feel as if they’re getting pushed aside and out. “Cutting ‘Old Heads’ at IBM” is the headline on a recent ProPublica report that found IBM had targeted older employees for layoffs even when they were rated as high performers. The story further alleges that money saved from the layoffs was used to hire younger replacements; that IBM encouraged workers targeted for layoffs to apply for other jobs within the company even as it advised managers not to hire them; and that after telling some older workers they were being laid off because their skills were out of date, the company brought them back as contract workers, often for the same work at lower pay. But companies eager to move baby boomers along should be careful what they wish for. For one thing, millennials are less likely to stay in jobs than others, and turnover often carries high hidden costs. For another, few workplaces have mastered a system for transferring knowledge from one generation to the next. There are other compelling reasons for organizations to not give baby boomers the bum’s rush. He notes that if everybody in an organization is middle age and older and a large part of its customer base is younger people, then there is logic in hiring some employees who can relate to those customers. “Does that mean a wholesale clearing out of baby boomers? Absolutely not,” he adds. Energizing at least some of the push for generational turnover are stereotypes that have developed around baby boomers, millennials and others – for example, that millennials are apathetic, and that boomers are intransigent and tech-adverse. But are there really intrinsic, permanent differences among the generations? No, says Wharton management professor Peter Cappelli, director of the school’s Center for Human Resources. This doesn’t necessarily mean that today’s 21-to-36-year-olds are the same in every way as 21-to-36-year-olds a half-century ago. For one thing, workers from each succeeding generation since the so-called “greatest” are less likely to be white. In the U.S., the generation that is 72 or older is 79% white and boomers are 72% white, while whites makes up just 56% of millennials. More LGBTQ workers today are likely to be out. This more diverse workforce brings different experiences to bear on decisions. Still, the tendency to stereotype workers according to age is “really quite profound,” says Wharton management professor Stephanie Creary. “The reality is, we use labels and categories as a way of simplifying complex information; we refer to men and women and we assign attributes and characteristics to those groups of people to make it easier to understand the patterns of their actions.” The problem comes when that information is full of negative connotations — such as baby boomers aren’t into tech, they don’t want to get with the times, or millennials aren’t committed at all. “I think it’s a fine line between how we understand some of the things that influence workers in our workforce without using those categories to create harmful stereotypes,” Creary notes. For years, it was understood that people take a job, and as they got older they would get promoted, says Creary. “There were tighter links between age and tenure and promotions. In the meantime, many baby boomers feel their options are limited. Some may not have enough squirreled away for retirement to end their careers, while others whose careers have been ended unjustly by their employers find themselves stymied by limited legal remedies. In 1991, Congress amended Title VII to incorporate the mixed motive model for Title VII discrimination claims. However, Congress never amended the ADEA. In 2009, in an age discrimination case involving the demotion of an employee with 32 years’ service, the Supreme Court focused on the language of the ADEA, “because of age,” and held that the plaintiff must prove that age was the determinative factor for the adverse employment action. Says Bellace: “In other words, the plaintiff had to show that ‘but for’ his age, he would not have been demoted. It was not sufficient that age was one factor, even a substantial factor, if there were other factors.” As a result, in an ADEA case the plaintiff must prove that other reasons the employer offers for the adverse employment action are mere pretext. For all of the challenges, though, baby boomers should hardly think of themselves as helpless. But there is a vast difference between asking an older employee to train a new one, and a culture that promotes mentoring on an ongoing basis. “If I am a baby boomer being replaced by a cheaper millennial, why would I want to give them my institutional knowledge?” says Bidwell. “On the other hand, it’s going to be very hard to transfer that knowledge. We talk about tacit and explicit knowledge, there are things you don’t know you know, and no matter how much you know you know you can’t really write it all down.” Traditionally the way employees have passed down knowledge is through apprenticeships and mentorships, having younger people work alongside older people for a fairly substantial period of time. That doesn’t happen much now, he says. The leaders of North and South Korea held talks last week, and that in itself is significant. But the talks should not be confused with a solution to the problem on the Korean Peninsula. There are five players involved in these negotiations: North Korea, South Korea, the United States, China and Japan. Each has very different imperatives forcing its hand, and each has varying amounts of influence over the situation. Some can be excluded from the deal but not all, and finding a common basis for an agreement among even three or four players is difficult to imagine. It can be done, but only with concessions that would undermine crucial interests for at least some. Let’s review what each country seems to need. North Korea wants to secure its regime from outside forces. The outside force that most directly threatens North Korea is the United States. The presence of significant American forces in South Korea and the region is seen as a threat to the regime. They might not be a threat at the moment, but the future is uncertain, and if North Korea is weakened internally, it can’t trust the United States not to take advantage of the opening. North Korea must assume the worst. It therefore wants all or most U.S. forces to withdraw from South Korea, and possibly limitations on U.S. naval forces in the Sea of Japan. In addition, North Korea wants access to South Korean economic capabilities, without allowing the introduction of corrosive ideology into the North, which will be difficult to pull off. South Korea wants to make certain that nothing threatens its economic well-being, especially not a war on the Korean Peninsula. At the same time, it wants to be certain that North Korea is not in a position to assert military power that South Korea cannot check by itself. South Korea does not want to become subordinate to the North and, therefore, wants to maintain a basic defense relationship with the United States, including some U.S. presence in South Korea, perhaps lightening the U.S. footprint but not removing it altogether. The United States’ primary imperative is to keep North Korea from having the ability to launch an intercontinental ballistic missile at the continental United States. How North Korea will evolve politically is unknown, and the risks associated with that uncertainty are unacceptable for the U.S. At the same time, the United States also wants to maintain its military presence in the region as a counter to Chinese military power. South Korea is a base from which to project power into the Yellow Sea. A complete American withdrawal is impossible because it would shift the military balance in the región. China’s core imperative is to see that its coastal seas come under its control. An equally important imperative is for China not to rupture relations with the United States, with whom it has a crucial but currently delicate economic relationship. The Chinese would support any agreement that reduces the U.S. presence in the region and likely would try to manipulate the situation to achieve this, but they would do so with as little visibility as possible, complicating any negotiation. Finally, Japan has an enormous interest in the Korean Peninsula, as it has historically been a buffer between Japan and China and a base from which Japan could project power. A united Korea that would remove the United States from the equation would be an existential threat to Japan, forcing it to increase its already substantial military force. Given Korean hostility toward Japan, this could firm up South Korean insistence on retaining U.S. forces, or perhaps force an accommodation with the North. These are contradictory but both plausible and, for Japan, risky results. The question of North Korea’s nuclear capability has opened the door to these negotiations, but this issue is not the real heart of the matter – except from the United States’ perspective. At the heart of the matter is that there is a contradiction between what North Korea needs to ensure its security and what South Korea needs. It is quite possible that they can overcome this problem on their own, but they cannot disregard the strategic interests of the two major powers, the United States and China, both of which could override any agreement that is not in their interest. Meanwhile, Japan, the world’s third-largest economy and a major regional power, also faces a threat from the Korean Peninsula, particularly if it falls under Chinese influence. I am not arguing that a settlement is unlikely, but merely that reaching a settlement will require major concessions over matters that are at the core of every player’s national strategy, and making those concessions will be extremely difficult. I am reminded of the U.S.-Chinese entente in the 1970s. That situation was relatively simple. There were three powers involved: the United States, China and the Soviet Union. The first two had adversarial relations with the Soviets and, therefore, an interest in collaboration. The issue was relatively clear and the level of trust required was minimal. But today, there is neither simplicity nor clarity. North Korea might well give up its nuclear weapons, but what it would demand in exchange would not only be hard for the other players to concede but would trigger a significant degree of regional unease and instability. It is too early to think of Nobel Prizes. We are in a dangerous period of economic transition. The Fed is shrinking its balance sheet and raising rates after a decade of stimulus. The dollar is losing its ground. Bonds are at risk after a 30-year rally. Not to mention record-high valuations in the stock market and the return of volatility. Bottom line: risk is everywhere, and there seems to be no place to hide. But as you’ll learn below, there’s one asset class that top money managers turn to as the ultimate hedge. Below are highlights from SIC 2018 with quotes from some of the best investors in the world about gold and its role in your portfolio. Even if you are not into gold, don’t let it put you off. This update will give you a lot of valuable insights into the current state of our economy and the markets from people who know it best. At the SIC, Mark Yusko, CIO and CEO of Morgan Creek Capital Management, gave an emotional speech comparing the Fed to a dictator that robs the nation. Everybody's all excited about QE. Everybody's all excited about the Fed, but you realize that in the last 10 years, we had the worst growth in the history of America. Let that sink in for a second... 1.4% real growth for the last 10 years. And we have indebted our future to the tune of $20 trillion for nothing. 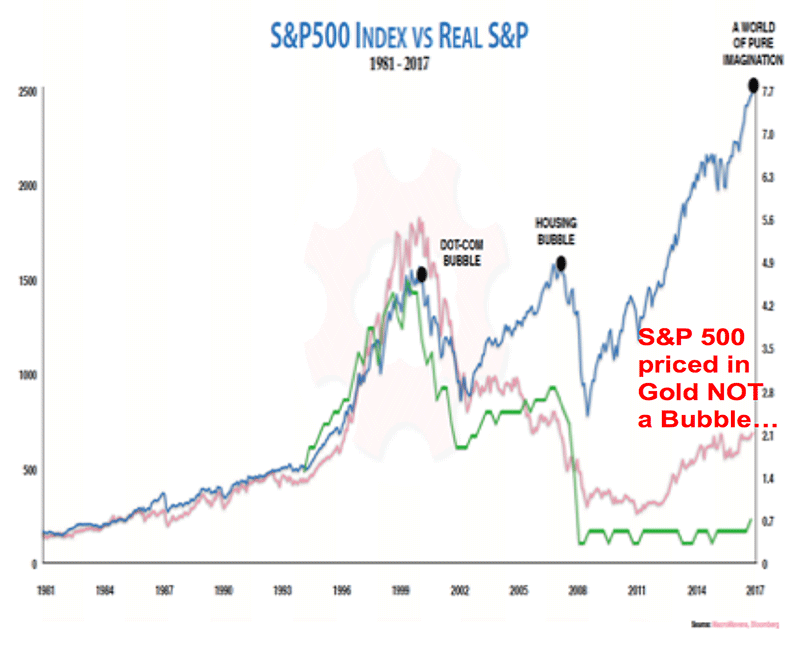 He showed a chart that plots the S&P 500 price in nominal terms (blue line) and in gold (pink line). Now we see a massive base building in gold. Massive. It's a four-year, five-year base in gold. If we break above this resistance line, one can expect gold to go up by, like, a thousand dollars. Louis Gave is the co-founder and CEO of Gavekal Research. The main theme in his keynote speech this year was a once-in-a-generation shift from a deflationary boom to the inflationary boom that we see today. According to Gave, these shifts occur every 30–40 years, usually as a result of policy errors. If that’s the case, Gave told the SIC attendees, the investing environment will radically change. He suggested that investors reconstruct their portfolios and get out of bonds as a diversification tool because they are not a good diversifier in periods of inflationary booms. 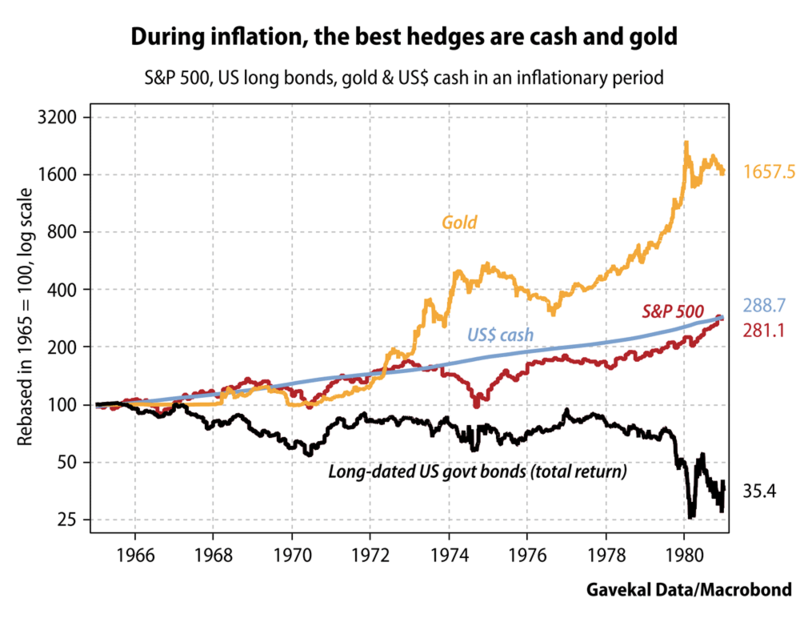 To prove his point, Gave showed a chart of the performance of gold, cash, and US Treasuries as hedges during inflationary booms (see below). In the last inflationary boom, from 1966 to 1980, Treasuries were a horrible choice for your portfolio. Meanwhile, gold and cash shined. Another positive trend for gold that Louis Gave sees is the growth of emerging markets (EM). Grant Williams, author of Things That Make You Go Hmmm..., warned investors about the dangerous implications of a shift in US monetary policy—another good reason to invest in gold now. 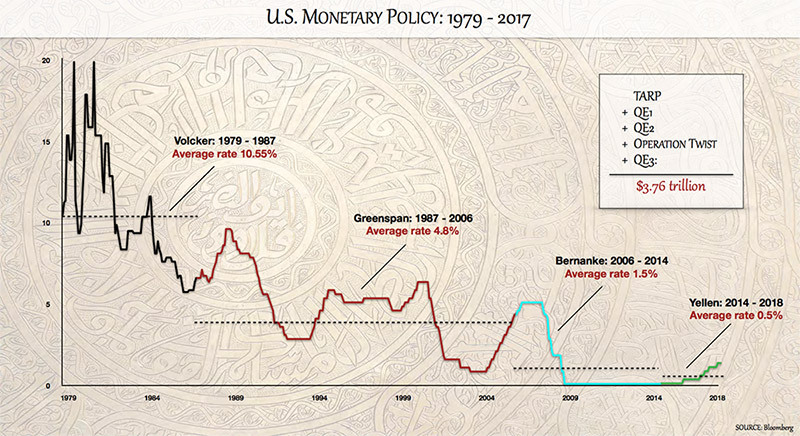 According to Williams, for the last 40 years, US monetary policy has been built on constant injections of stimulus. Since Paul Volcker’s tenure in the early 1980s, every Fed chair has pushed interest rates lower. Now QE is officially over and is to be reversed. Williams thinks that this marks a monetary shift, which spells trouble for equities. He gave a brief rundown on the effects that the Fed’s three rounds of QE had: “Stocks soared. The key message for investors is, Williams said, that after nine years of one long, pleasant, ride in equities, we've reached the point where the main driver of equity prices is about to reverse. In the best case scenario, he thinks quantitative tightening will reverse the effect of the Fed’s stimulus measures on the stock market. However, he doesn’t rule out a much bigger sell-off. 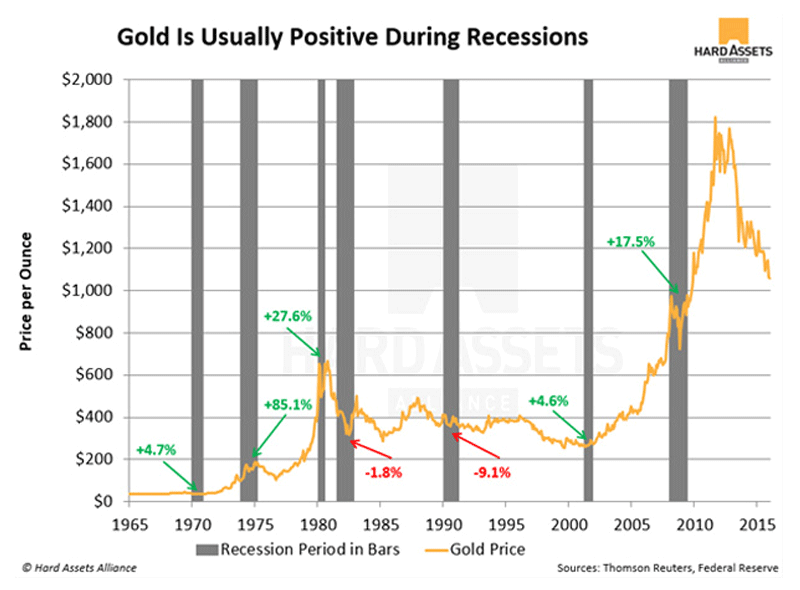 Williams likens today’s situation to the period leading up to the 1970’s recession where a shift from equities and cash to gold could happen unexpectedly fast. What happened with that late-cycle stimulus that Johnson put in, and what happened to equity markets, bond yields, wage prices, CPI, and gold, going into the late ‘60s into the early ‘70s, we saw these things take off. And these things are cyclical. So to me, if this inflation story gets some traction, then I think you're going to see money move to gold reasonably quickly. Further, Williams suggested, in periods of quantitative tightening, equities eventually crash. 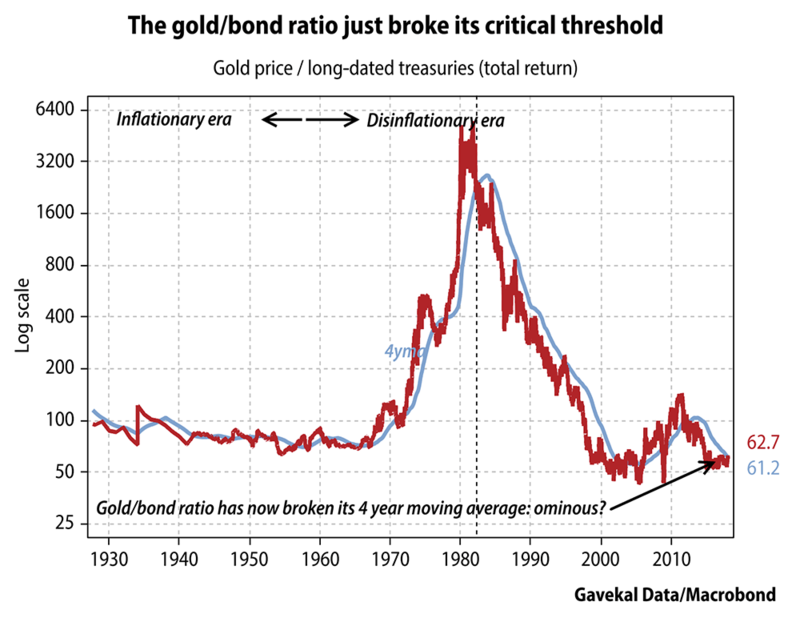 Since gold is inversely correlated to the stock market, this is another reason gold should rise in the coming years. In fact, history shows that gold has rallied in the last five out of seven recessions. Now that you’ve heard from our notable SIC speakers, we’ll share the Mauldin Economics perspective on gold. Physical gold is not for speculation. You don’t buy gold to get rich quickly. It’s a long-term investment. More importantly, gold is an ideal hedge against currency devaluation, a financial crisis, or a black swan event. Most investors are underweight gold and won’t move to correct their mistake until it’s too late. In some ways, we are lucky today—gold ’s price is a relative value compared to where it will be in the coming years. You still have time to hedge your portfolio against the financial headwinds that are already looming on the horizon. But perhaps not much time. Tech stocks like Facebook and Amazon have led the market’s gains over the past several years. Today, they no longer look invincible. In this increasingly volatile environment, allocating some of your liquid assets to gold is a prudent move. Still, most investors stumble when it comes to acting on the recommendation. How do I buy gold? Should I buy gold bullion or collectibles? Is it better to get coins or bars? Where do I store it? And why even bother with physical gold when there is an ETF for everything? LONDON – Not so long ago, there were two competing explanations of unemployment. 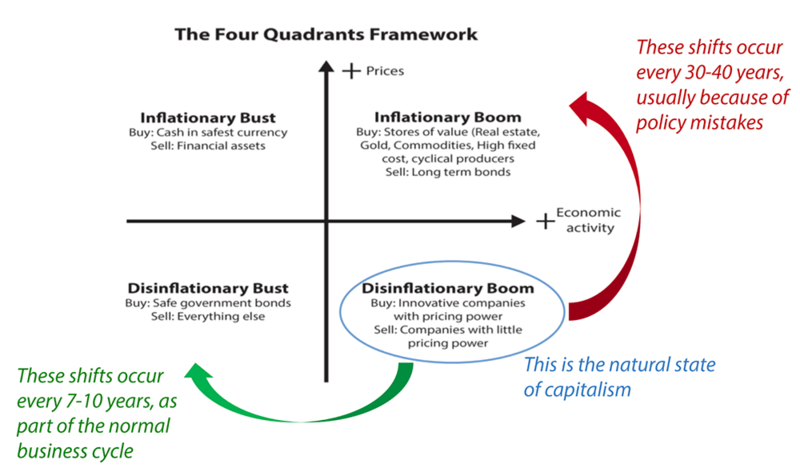 The first was the Keynesian theory of deficient demand, which holds that workers become unemployed “involuntarily” when their community lacks the money to buy the goods and services they produce. The second was the view often associated with the Chicago School, according to which unemployment is a voluntary choice of leisure over work at whatever the offered wage. Now, a third explanation is gaining traction: declines in full-time work opportunities and real wages are both due to automation. To be sure, the idea that robots are gobbling up human jobs is a new slant on the very old problem of technological unemployment. But it is a slant that merits attention, because the problem cannot be solved with the conventional policy responses. The “official” narrative about technology treats accelerating change as inevitable. According to acronymically named institutions, think tanks, task forces, et hoc genus omne, automation and artificial intelligence (AI) will soon eliminate or alter a large but unpredictable number of human jobs. At the same time, embracing new technology is considered necessary for a country’s geopolitical and competitive success. Thus, disruptions to existing work patterns should be welcomed and “mitigated,” by adapting education and social-security systems to the needs of an automation-driven job market. So says The Work Ahead: Machines, Skills, and US Leadership in the Twenty-First Century, a new report published by the Council on Foreign Relations. Like many other recent reports on the topic, this one starts from unargued – and largely unwarranted – assumptions and arrives at anodyne conclusions. For example, we are told that technological possibilities will determine job outcomes. Because most jobs will be automated in whole or in part, resistance is futile, and adaptation (“mitigation”) is the only option. Moreover, technological innovation must be enthusiastically embraced, or the “best and brightest” workers will flock to foreign competitors. We are also told that if the United States were to slow the pace of automation unilaterally, it would forfeit its dominant position on the world stage. On the assumption that China is a strategic enemy of the US, it is imperative that the American people embrace technological innovation to win the race for world leadership. If one abides by these ground rules, then the only answer to the march of the robots must be an active labor-market policy geared toward preparing workers to race with machines. The challenge of a more precarious job market is to be met by making people more precarious. And yet, to “mitigate” this problem, the report proposes more of the same policies that brought us to where we are. Accordingly, monetary policy should be used to expand employment – even though it has consistently failed to do so. And, “Congress and the Trump administration should also use fiscal policy prudently to maintain strong growth and employment” – even though “the worsening federal budget deficit … will unfortunately further handcuff” efforts in this direction. 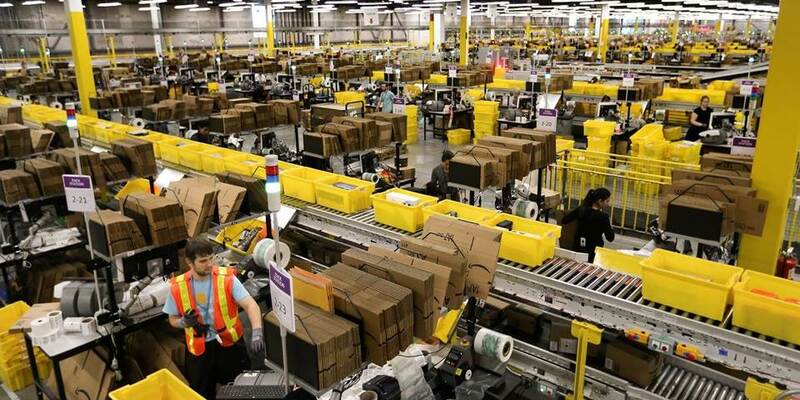 So much for using macroeconomic policies to confront the “jobs challenge.” Instead, we are left with the usual microeconomic measures to prepare people for algorithmic employment – that is, the use of big data to match people with the jobs they will need to remain consumers. Again, we are told that future labor-market participants should be equipped with job-targeted education and portable social-security pots to help them jump from one automated workplace to another. In the end, the report never makes up its mind about whether flexible forms of work in the “gig economy” represent Keynesian demand deficiency, voluntary choices for part-time work and self-employment, or the involuntary encroachment of automation. And while the authors admit that globalization and technological dynamism have left a large part of the US population and territory behind in terms of wealth, income, and self-esteem, their own remedy is to redouble ongoing efforts to bring the “left behinds” up to speed. For my part, I would draw a different conclusion from the same facts. If the goal is to lift all boats as far as possible, then some slowdown of globalization and automation is inescapable. Every citizen has a right not to be left too far behind. Upholding that right should not be sacrificed in the name of largely bogus calculations about the effects of slowing down automation on US global leadership.